1. Cut off the artichoke stalks so they stand upright. Add to a pan of boiling water with the peppercorns, bay leaves and ½ the lemon juice; cover and simmer for 30-40 minutes, or until you can pull a leaf from one of the artichokes easily (you might need to weight the artichokes with a heatproof plate to keep submerged). Drain upside down. 2. Meanwhile, melt the butter in a small pan. Stir in the anchovies for 2-3 minutes, until dissolved. Stir in the garlic and take off the heat. Season and add a little more lemon juice to taste. 3. 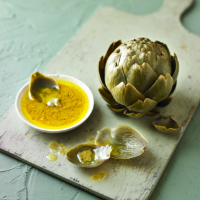 Serve each artichoke with a pot of anchovy butter. Scrape the flesh from each leaf with your teeth, then discard the hairy choke and enjoy the heart.